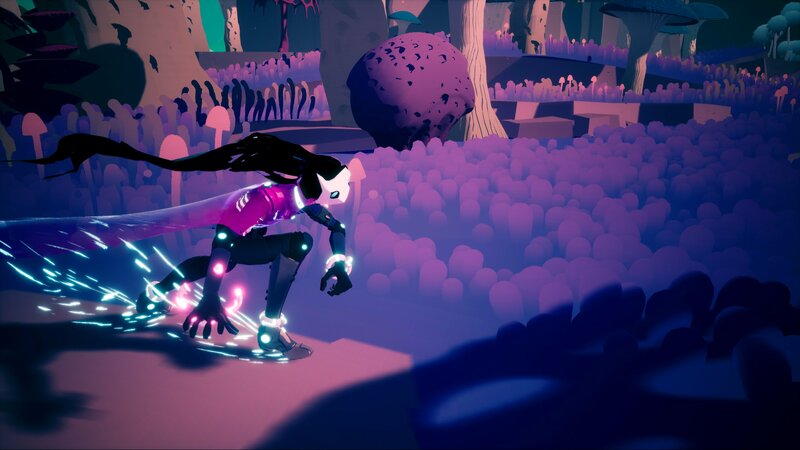 We’ve known that the studio behind Hyper Light Drifter, Heart Machine, was working on a new game for quite some time now. Job postings as recent as this month have suggested this game was still in its early phases. And it is. But now we have the first trailer. The game is called Solar Ash Kingdom and it will be published by Annapurna Interactive. We see presumably the lead character essentially skating towards a giant beast. Stepping away from the retro look of Hyper Light Drifter, Heart Machine has gone with something more modern but equally, if not more, charming. Take a look at this lush, beautifully lonely world in the trailer below. While the trailer confirms Solar Ash Kingdom will be available on Epic Games Store (PC), no other platforms have been officially confirmed. However, in a recent tweet Heart Machine confirmed that “console releases are in the cards” but the team is “working out when [they’d] do what since [the game’s launch is] still a bit off.” The fact that Hyper Light Drifter eventually made its way to the PlayStation 4 is a good sign that Sony fans may be able to dig into this game as well. Solar Ash Kingdom isn’t a sequel to Hyper Light Drifter but it is set in the same universe despite being a full 3D game with a third-person camera (made in Unity, for those curious). In addition to sharing a universe, Rich Vreeland aka Disasterpeace will return to handle the audio experience. What do you think about Solar Ash Kingdom‘s reveal trailer? Let us know in the comments below.